Alfred Montrem was born on April 30, 1935, in Schenectady, New York. He enlisted in the U.S. Air Force Reserve on January 20, 1953, and entered the Aviation Cadet Program of the Air Force on April 10, 1957, earning his commission as a 2d Lt and his pilot wings on July 23, 1958. Lt Montrem next completed Helicopter Pilot Training at Stead AFB, Nevada, in March 1959, followed by service as a helicopter pilot with the 7272nd Air Base Wing at Wheelus AB, Libya, from April 1959 to April 1961. 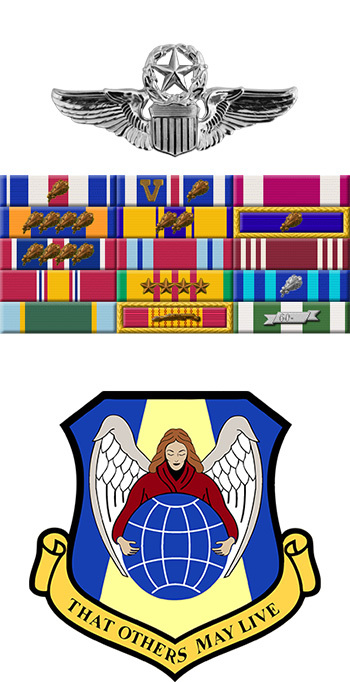 He served as a helicopter pilot with the Lowrey Technical Training Center at Lowry AFB, Colorado, from May 1961 to August 1965, and then as an instructor helicopter pilot with the 3637th Flying Training Squadron and 3630th Flying Training Wing at Sheppard AFB, Texas, from August 1965 to September 1967. Capt Montrem next served as an HH-53 Super Jolly Green Giant pilot with Detachment 2 of the 37th Aerospace Rescue and Recovery Squadron (ARRS) at Udorn Royal Thai AFB, Thailand, from September 1967 to March 1968, followed by service with the 40th ARRS at Udorn from March to September 1968. He served as an HH-53 pilot and instructor pilot with the 48th ARRS at Eglin AFB, Florida, from September 1968 to February 1969, and then with the Aerospace Rescue and Recovery Training Center at Eglin AFB from February 1969 to December 1970. During this time, Maj Montrem served as Copilot of the HH-53 "Apple One" during the Son Tay Raid, a clandestine mission to rescue American Prisoners of War in North Vietnam on November 21, 1970. His next assignment was as an HH-53 pilot with the 44th ARRS at Patrick AFB, Florida, from December 1970 to November 1971, followed by service as an HH-53 pilot with the 67th ARRS at RAF Woodbridge, England, from November 1971 to November 1973, and later as Chief of the Operations and Training Branch with the 41st Rescue and Weather Reconnaissance Wing at McClellan AFB, California. His final assignment was at McConnell AFB, Kansas, where he retired from the Air Force on November 1, 1981. Alfred Montrem died on September 6, 1994, and was buried at the Florida National Cemetery in Bushnell, Florida. 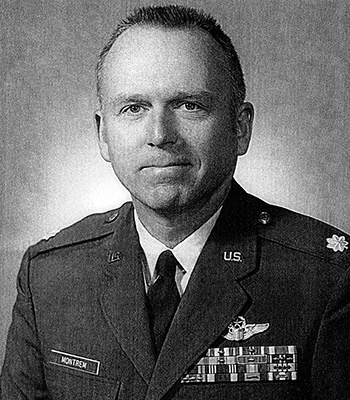 Major Alfred C. Montrem distinguished himself by gallantry in connection with military operations against an armed enemy of the United States during the Prisoner of War search and rescue operation at Son Tay, North Vietnam, on 21 November 1970. On that date, Major Montrem, as a pilot of a helicopter carrying part of the ground rescue party, flew deep into the heart of enemy territory in a bold night attempt to rescue American Prisoners of War. Although exposed to enemy ground fire which included numerous surface-to-air missiles, Major Montrem successfully penetrated these defenses. With gunners laying down suppressive fire, the United States Army Special Forces were placed in position to assault the camp. With complete disregard for his own safety, he maintained a position to provide assistance and immediate evacuation upon completion of the assault. The personal skill and extreme courage displayed by Major Montrem in this very hazardous rescue attempt contributed immeasurably to the ultimate effectiveness and tactical success of the mission. By his gallantry and devotion to duty, Major Montrem has reflected great credit upon himself and the United States Air Force.